With natural vitamin c and hyaluronic acid, this Marine Collagen Beauty Blend is specially formulated to help support skin, nails, hair, joint and bone health. Collagen is the most abundant protein in the human body and is the component of skin, bones, muscles, cartilage, ligaments and connective tissues. Collagen is the substance that holds the body together and forms a bond to provide strength, elasticity and structure. 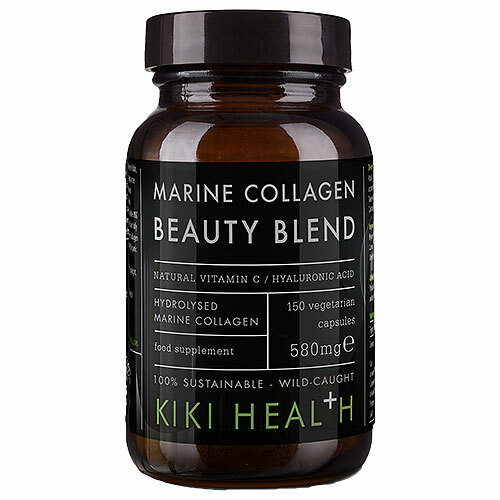 KIKI Health`s Pure Marine Collagen Powder is made from 100% purified hydrolysed collagen, extracted from sustainably sourced wild fish off the coast of France by a responsible MSC certified fishery. It is enzymatically processed to keep the peptides intact which are fully digestible and gentle on the gut due to their low molecular weight. Marine Collagen Beauty Blend has been supercharged with natural vitamin C (Organic Camu Camu Powder and Organic Acai Powder) and Hyaluronic Acid. Hydrolysed Marine Collagen (fish), Organic Acai Powder, Organic Camu Camu Powder, Hyaluronic Acid. Shell Capsule: Hypromellose. Adult Intake: 2-4 capsules once or twice daily according to your personal and lifestyle needs. Take before or after food with water. Can take up to 15 capsules per day if required. Do not exceed recommended stated dose. 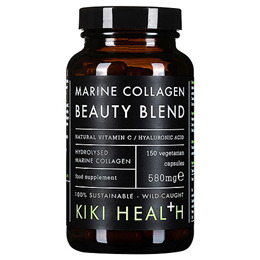 Below are reviews of KIKI Health Marine Collagen Beauty Blend - 150 Vegicaps by bodykind customers. If you have tried this product we'd love to hear what you think so please leave a review.